For being part of a family that doesn’t ever need to go back-to-school shopping, I LOVE school and office supplies. It’s probably not surprising that I’ve been a planner junkie since high school, when my best friend Phil and I had matching Five Star First Gear planners that went everywhere with us. 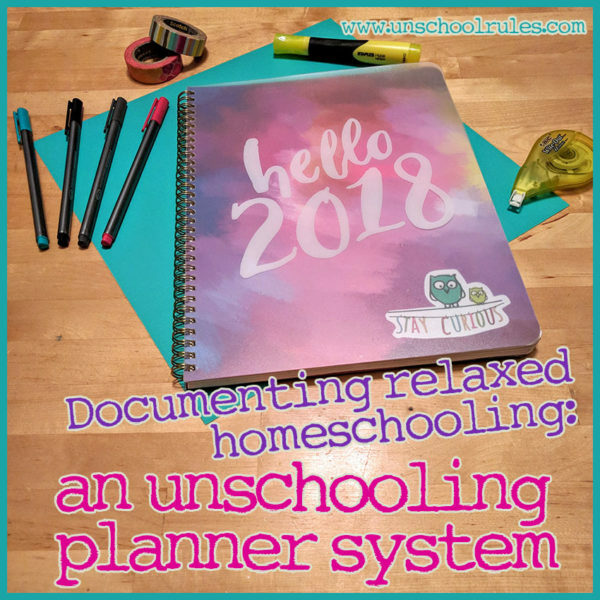 Fast-forward ::cough:: some number ::cough:: of years later, and now I have an unschooling planner system that helps me organize my life and keep track of our relaxed homeschooling lifestyle. That’s why I want to share a look at our family’s unschooling planner system today. The goal is not for you to replicate this system by any means – but I thought if I show how I think about what I track, maybe it will help other families figure out what will work best for them! Last year, I started using the Extra-Large Flexi Planner from Orange Circle Studios. These run from August of one year through December of the following, so I started my new “2018” one last month. 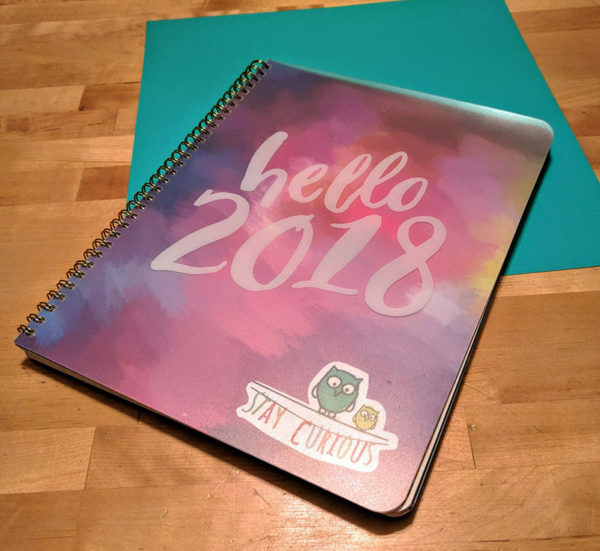 You can see all of the 2018 design options here; I’m using the “Hello Aquarelle,” as I am not really into flowers and actually am allergic to pineapples, and thus didn’t want to stare at them all year. I like this because there is a set of monthly calendars in the front, followed by pages with lined sections for each day in week-by-week format behind the monthly pages. Let me be really clear: You don’t need to buy anything fancy to implement a planning system. While I drool over the Instagram accounts of those $200-in-planner-supplies people, I have no desire to become one. Get a dollar-store calendar and a pen, and you can do pretty much everything I show here. 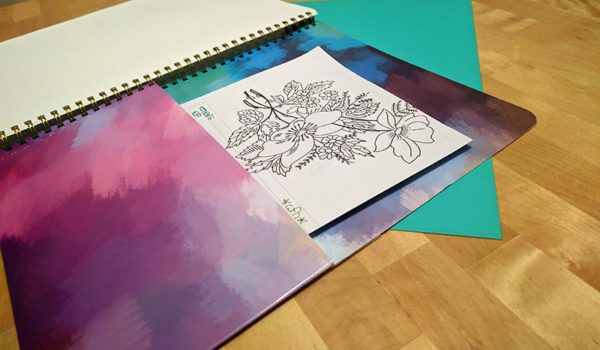 Orange Circle Studios “Hello Aquarelle” Extra-Large 2018 Flexi Planner. Some washi tape I already had on hand. My favorite pens, the Staedtler Triplus Fineliners. Some good colored pencils – the Fantasia 36-pencil set is our current favorite. Since, you know, I tend to make mistakes, correction tape helps. And, of course, since I like a good sense of accomplishment, highlighters help me keep track of what I’ve already done. owl sticker was actually a freebie at a tech conference I went to for work, and I loved it so much I carefully carried it over from last year’s planner. Before I used this planner, I was a devoted user of the bullet journal system. I’m not going into detail about what that is, but my friend Jen McGrail’s “Bullet Journaling 101” post is a great place to start if you don’t know much about it. I was doing a LOT of work by hand in my old bullet journal, though – writing every day’s date, drawing my monthly calendars, etc. The system I have now takes the parts of bullet journaling that were working well for me, but gets rid of a lot of the routine work. Is it as fully customizable? Definitely not, but the time saved is a great trade-off for me. Why use an unschooling planner system? Another point of radical clarity: I am not a proponent of over-documenting your unschooling. If you try to make a list of everything your kids “learn” in a day, you’re kind of missing the point. I like sharing what we do on this website. My month-in-review wrapups are designed to show people some of the things unschoolers do – especially for those who are just starting their journey and wondering, “Will my kids ever learn anything?” So for myself, I don’t necessarily need to keep track of the cool rabbit trails we go down, but jotting short notes about them makes it easier to share and help others. It makes our end-of-year portfolio creation and transcript updating easier. Not all states require any kind of documentation; ours, Pennsylvania, requires a few specific things. Luckily, the evaluator who reviews our family’s portfolio is VERY unschool friendly. I often will just write a paragraph summary on a topic and list a couple places we went or methods we used to explore it and call it good; the hard part of that, though, is remembering in March what topics we were into in September, so our short notes help. 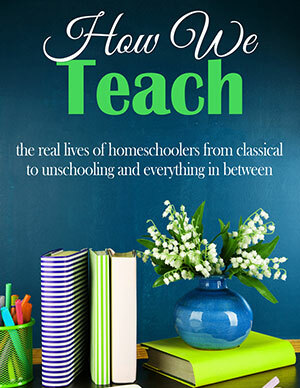 Read more about the Pennsylvania homeschooling portfolio – and see samples of ours, as well as Sarah’s transcript – here. It can help you be more present with your kids. Let me be realistic: I work full-time away from home, and, since she’s in her late teens now, a lot of Sarah’s free time is spent engaged in activities I’m not part of, like acting with local theater groups. Taking the time every day or couple of days to stop and think, “What have Sarah and I really been talking about lately?” is a good reset point for me when I don’t feel like we’ve been well-connected. If I have three days in a row where I have no idea what she did, my first thought isn’t, “Wow, she wasn’t learning,” it’s “Wow, I’m not engaged with her.” That helps me make it a point to check in and find out what’s up! An overview look at a month’s unschooling documentation. This is the first section of the planner I use, and it’s where the unschooling record-keeping piece comes in. Almost every day, I jot down a few things we did. These aren’t necessarily “educational” things in any traditional sense – but if we watched a movie or TV show, had a cool conversation, tried a new Universal Yums snack box, went to a restaurant or store, took part in a music lesson or play practice… that’s what gets written in the square for the day. You can see that some days have more than others. That has nothing to do with how much Sarah is doing or learning or experiencing – as I mentioned above, a lot of my focus in the record-keeping is to be engaged with what Sarah is doing. On the days where you only see one or two things, it’s where I was at work all day and Sarah was at play practice all night and then I sat down to do grad school homework and we barely said two sentences to each other. Each day, jot down the highlights in the main calendar box – a book, movie, conversation topic, place you went, etc. In the sidebar, keep track of important family notes, like paydays or bills or number of stuffed penguins you mailed. Don’t stress, and don’t overdo. If you miss a day, either add one thing you remember or just skip it. If you run out of room, don’t write anything else. A closer look at the monthly unschooling log. 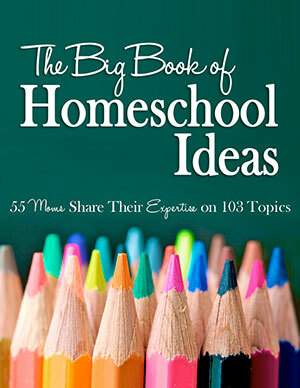 Items are highlighted once I mention them in my monthly wrapup post on Unschool Rules. Other things like bills, paydays and stuffed penguins sent are in the sidebar. The monthly log might be where the basic “unschooling planner system” comes in, but the daily log is how I run my life. But anyway, the daily log: This is where everything goes that I need to accomplish (or make sure someone else accomplishes, like getting Sarah to a class or practice). Write appointments in a different color. (You can see mine are teal.) That keeps you from overlooking them among the things that can migrate to another day. Controversial tip: Use Wite-Out Tape for the things you didn’t get done that you’re moving to another day. Some people follow the bullet journal method of crossing it out with an arrow, then carrying it forward. I need the mental freedom of not seeing a list of things I didn’t manage to do. Similarly, I don’t cross off things I have done, either. 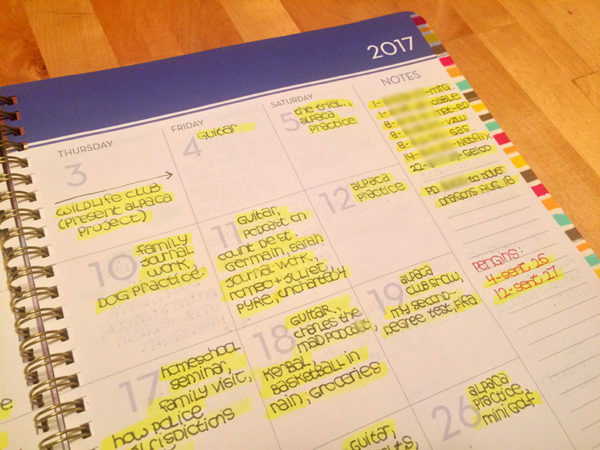 If you value a sense of accomplishment the way I do, highlighting tasks when you complete them feels really good. No, YOU wrote something down just to highlight it. That wasn’t me. Ever. Much. but the “regular stuff” – vacuuming most weekends, cleaning the bathrooms, long-term freelance projects that get done on specific days each week, sending invoices to other clients, etc. – those, I add a month at a time, as I need them. A detailed look at the weekly log. Finished tasks are highlighted; appointments with fixed times are written in teal. One of the coolest things in my older, more traditional bullet journal was my “year in pixels” spread. This is a place where you can keep track of your mood or the kind of day you’re having. As someone who lives with bipolar disorder, this has long been something I’ve found helpful to keep an eye on my moods and make sure they’re not going somewhere I don’t want to go. The Orange Circle Studios planners have a “Rate Your Year” page where this is already set up for you with a five-point scale! 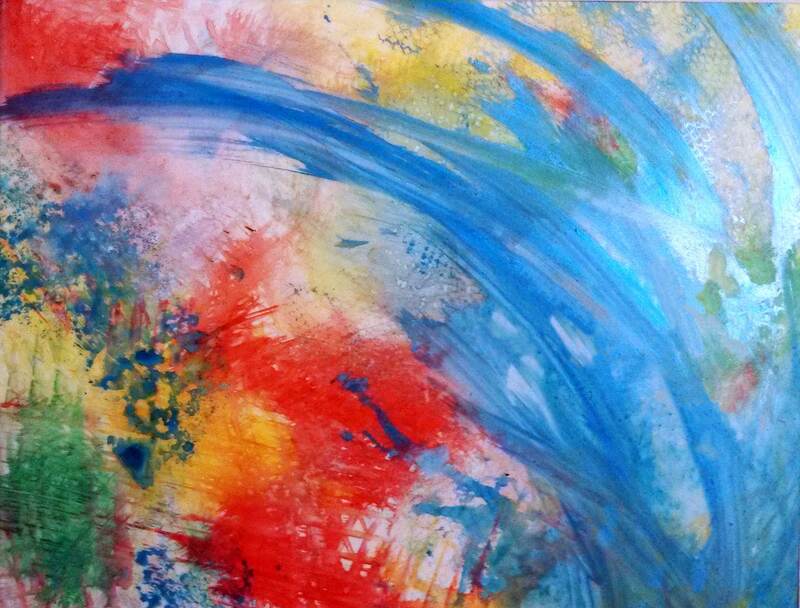 Just pick your colors (mine range from blue for great days to brown for horrible days) and color a square each day. I don’t remember to do this every night, but I try to do it every 2 or 3 nights. You might see that my scale is always “so-so” and up. This is sort of a weird fluke of my personality; I also grade almost all books I read on Goodreads at three, four or five stars. Of the 417 books rated there, I have given three reviews less than 3 stars. Similarly, I have no days so far in my year in pixels that are bad or horrible. Call it an optimistic personality; call it reserving bad ratings for things that really deserve them; call it creating a three-point scale. I don’t know. Anyway. Now you know a new thing about me, right? 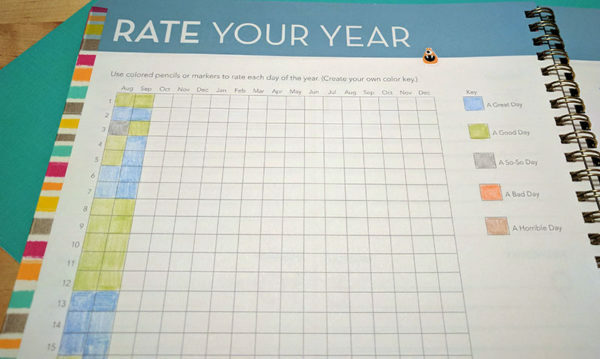 The “Rate Your Year” page takes the Year in Pixels bullet journal concept and makes it easier for me to actually do it. Rate Your Year page for keeping track of moods/quality of days. Budget Tracker. This is really cool, but we have a digital budget that Dan and I share, so I don’t need it written out. Plus, we track different stuff – focusing mostly on debt payoffs. But if you’re just starting with budgeting, the plan in here is a good one. Bucket list, another one I’ll start using when I do my start-of-2018 planning. Empty graph paper pages – I think these are there for other “modified bullet journalers.” If you do a bullet journal collection for something like books read or trips taken or steps toward a specific goal, this would be the place to do it. Event stickers for birthdays, holidays, vacations, parties, lunch dates, “don’t forgets” and more – there’s a whole page of these in the back. I’m not a huge sticker person. Though I have little owls and aliens on a variety of my pages, I don’t really use them to denote anything special, but if you do, they’re cool! Lovely back pocket is probably one of my most-used features. That’s where I store bills to be paid, my work to-do lists (when I’m working from home, I have to carry them with me), papers to fill out for the doctor, whatever. The pocket in the back of the Orange Circle Studio Extra-Large Flexi Planner holds papers that need to travel with me. 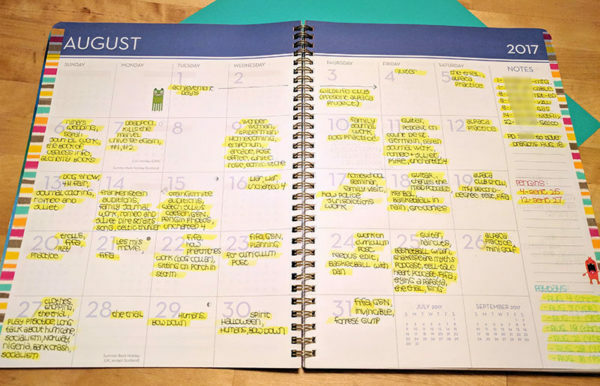 So this is what I consider the most important part of our unschooling planner system: It’s not the tracking or planning itself. Those are just means to an end – and in my case, the most important end is what I do with the data from the planner. Monthly blog posts: I mentioned earlier that these are the biggest reason why I keep track of our unschooling adventures – so I can share them and encourage other families on a similar path. You can see an archive of our lives here, month-by-month, all the way back to July 2014! Our homeschool portfolio and transcript: We are very lucky to have an unschooling-friendly evaluator. We send her a short summary of topics we’ve covered at the end of the year, along with some photos, and Sarah answers some questions for her. It’s incredibly low-stress, and the only thing that takes any time at all is summing up what we do. But guess what makes it easier? The notes and the roundup posts! I can easily get a feel for our “big themes,” and use those to frame out subject descriptions for the portfolio and credit topics for Sarah’s transcript. You can see more about how we organize our topics into credits for a transcript here. And, if you’re an Unschool Rules email subscriber, you can get a full editable transcript copy plus samples of our portfolio submissions; sign up here to get access! Our family scrapbooks: I’ve been a dedicated scrapbooker for the past decade, and every year, I make a family album with photos from the year, ephemera and souvenirs, notes about cool things we did and more. A key part of that is a short monthly calendar that includes our highlights, which helps reflect the things we do that don’t have photos. Guess what? The things in pink in the daily log in my planner… those are what goes on those calendars! It’s a super-simple way to manage that at the beginning of the following year when I sit down to scrapbook. When I work on my scrapbook for a particular year, I look back through my planner for special events (usually written in pink) to add to calendars like these. Like I said when I started out, my goal isn’t that anyone would say, “OH. This is perfect! I’ll just do exactly this thing that Joan does!” That would be weird. My hope is that by seeing how I think about planning – what I keep track of, what I don’t worry about, and most importantly, what I do with the info I track. No one needs to document for the sake of documenting; make sure you have a use for what you’re tracking. Do you have any other planner questions, unschooling or otherwise? Feel free to ask them in the comments and I’ll be glad to help if I can! 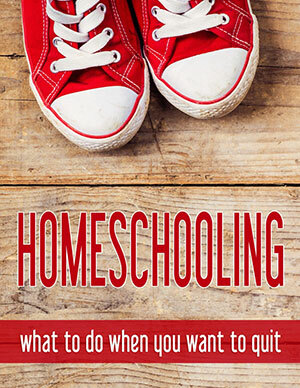 This entry is about blog, curriculum, homeschooling, pennsylvania, unschooling. The previous post was Unschooling: Our August 2017 adventures. The next post is A day in the life of unschoolers, 2017 edition. Thanks for sharing – I love to see how different people handle this. I, too, love office and school supplies while, at the same time, have come to terms with the fact that a lot of it is unnecessary. Also, I’m an artist but I don’t like to spend a lot of time making pretty calendars or scrapbook things (hey – at least all our pictures are sorted in a box). I created my own logging and planning forms, and I like to to log things for a lot of the same reasons – sharing on my blog, being ready with details should it ever be needed (in 17 years of homeschooling, it hasn’t been), and so on. I don’t log EVERYTHING (there are only spaces for 9 activities, books, conversations, etc. in a day). But, I do note what different “subjects” were addressed in a single activity – I just find that delightful since we are learning about so many different things at one time. I shared my approach on my website as well. Thanks for your perspective. Diane, thanks for your nice comment! That’s the thing I like most about our system – the fixed-size boxes mean I can’t spend all my time documenting and missing all the real fun and learning! I use a bullet Monthly journal only. 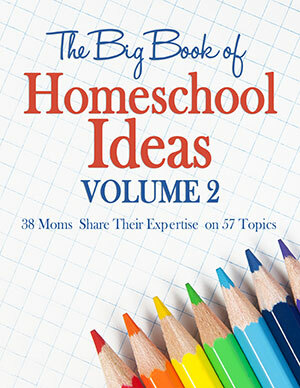 I simply use a lined 8 x10 journal as my log in documenting our homeschool journey. at the begaining of the monthly i list all the stuff we do that is a “Givin” all the things we do day in and day out that i know will be in our month. example reading, life skills, scouts, Art, minecraft masterpieces etc. i don’t list everything they choose to read unless we’re doing a “unit study” together. Throughout the month i take time to list things that we’ve done that they choose to do, or that have simply come up in our daily life. such as the ice/winter blizzard going on in the east coast. or the discussions that are sparked by something they see or heard about. this is a good system for our family. logging things Not day by day but simply listing them on a regular journal as “what we did that month” as we go alone throughout the month. Elizabeth, that’s a great system! It sounds very similar to what I do – I have to admit that while I use the calendar days, I’m more likely to go back at the end of the week and write in interesting stuff that happened at some point without really knowing which day! Just a quick question!! What do you use the Washi tape for?? I may have overlooked that bit but i didnt see anything. And also thank you for posting this, I kept thinking to myself, unschoolers don’t schedule stuff, but i HAVE to keep track SOMEHOW!! Saving my life here!! Chelsi, great question! That’s what you see down the outer sides of the pages in the pictures, done so I can find my place. I don’t washi til I get to a page, so for instance, right now, the daily pages are taped through the one that starts with Feb. 19 on the front and ends with March 4 on the back. After that I’ll tape the next one – so I can flip right to where the tape ends to know I’m on the right week! And the monthlies are the same way. Thank you for this post. We are just entering “the year of unschooling” and I had an idea of how to document for our evaluator but seeing what you do has made it much easier. Kristina, nice to hear from you! I hope you’ll find it easier to document. If you haven’t already seen them, I do have actual samples from our portfolio that go to our newsletter subscribers, you might find those helpful too!